(Bel Air, MD – August 28, 2015) Governor of Maryland Larry Hogan recently reappointed CEM’s John Mettee III to a third term as member and chair of the state Board for Professional Land Surveyors. Mr. Mettee will serve an additional, five-year term, supporting the surveying accountability and legislative efforts throughout Maryland. 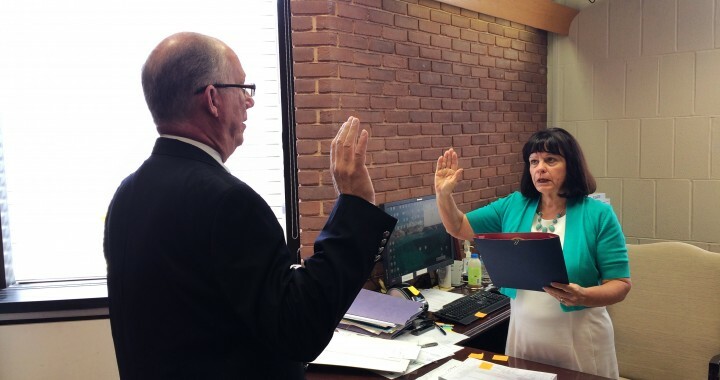 Mr. Mettee was sworn in today during a small ceremony, with Chief Deputy Clerk Linda Settle presiding on behalf of Harford County Clerk of the Court Jim Reilly. With 42 years in the surveying and engineering industry, Mettee possesses the industry knowledge and legislative expertise, as well as the leadership abilities to make a strong difference for the profession, state and CEM’s clients. Since joining the CEM team, Mettee has been an integral component in building a robust, full-service surveying team to meet the needs of CEM’s growing client base. Additionally, in his associate role he provides oversight and consultation in surveying, design, layout and site planning. In his role as chair during his previous term on the Board, Mr. Mettee made numerous contributions to the critical initiatives of the state Board. Most notably, he actively assisted in passing legislation in May 2015, HB720 – Architects, Landscape Architects, and Professional Land Surveyors – Firm Permits, to help ensure compliance of the existing Firm Permit Law. The Maryland Board for Professional Land Surveyors qualifies and licenses persons seeking licensure to practice as a professional land surveyor. In addition, the Board provides regulatory services in investigating complaints against licensees, as well as complaints related to unlicensed practice and issuing appropriate discipline via a reprimand, suspension or revocation of a license. As a regulatory body, the Board brings credibility through accountability to the profession, ultimately making a positive difference for all Marylanders.